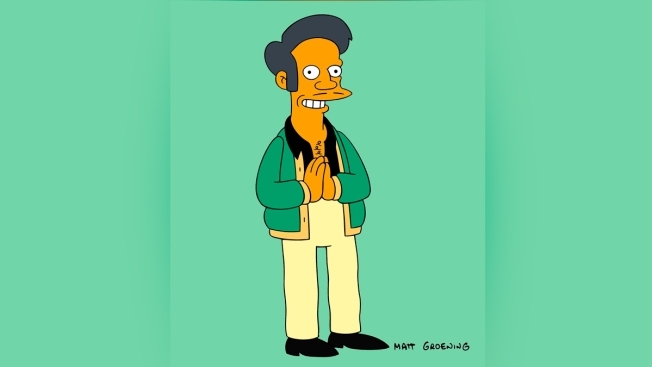 This image released by Fox shows the character Apu, an Indian shop owner featured on "The Simpsons," animated series. Fox says it trusts the creators of the series to handle the show's depiction of Apu, which has drawn fire as a racist stereotype. Creators of "The Simpsons" have the freedom to handle the show's depiction of Indian shop owner Apu in the right way for their show, a top Fox executive said. Apu, the Kwik-E-Mart clerk who has sold expired food and ripped off customers in the long-running animated Fox series, has come under fire as racist and stereotypical. The criticism flared after the recent release of the documentary "The Trouble with Apu." "We have had conversations with (executive producer) Jim Brooks and his team, and basically we've left it up to them," Fox Television Group Chairman and CEO Dana Walden told a TV critics' meeting. "They've treated the characters with so much respect, we definitely trust them to handle it in a way that will be best for their show," Walden said. She's unaware of their plans, but "we all decided that was their decision." "The Simpsons," now in its 30th year, made a stab at responding to critics in an episode that aired last April. Mom Marge is sharing a book she enjoyed as a child with daughter Lisa but finds herself editing its slurs against people of Irish and Latin American descent as she goes. Lisa's response: "Something that started decades ago and was applauded and inoffensive is now politically incorrect. What can you do?" A photo of Apu appears, and Marge says, "Some things will be dealt with at a later date" and Lisa adds, "if at all." Comedian Hari Kondabolu, who wrote "The Problem With Apu" documentary to address how marginalized groups are represented in pop culture, attacked the show's response as sad and misguided. He was joined by a chorus of online protests. Walden had a measured response when asked about the episode's backlash. She called it "good information" for the creators, who she said focused on it and undoubtedly will take it into account as they further address the character. Hank Azaria, the cast member of "The Simpsons" who voices Apu, said publicly in April he hopes the show makes a change and he's willing to step away from the role, saying it feels like the right thing to do.